Healix Health Services has launched a new portfolio of products and services to help fulfill its mission to provide employers with a holistic, bespoke solution to their health and wellbeing requirements. Integrated healthcare has long been talked about as an ideal but there are few providers that can actually deliver on this. At Healix, we have the organisational structure, clinical expertise and service excellence to deliver on this holy grail of integrated corporate health & wellbeing. When it comes to looking after the health and wellbeing of employees, there are a multitude of schemes and insurance policies to choose from but they are rarely an ideal fit for each employer’s specific requirements. We believe in a consultative approach, ensuring that we understand our clients’ objectives before designing bespoke health and wellbeing solutions, enabling integrated provision across all of their health related employee benefits, irrespective of who the providers are. By tailoring benefits to clients’ specific requirements, supporting them with expert clinical insight and advice, we are able to give clients greater control over their health & wellbeing strategy, helping to ensure the most effective use of their overall budget. Central to our offering is a corporate healthcare trust which provides a high degree of flexibility and can provide many benefits when compared with a more traditional health insurance proposition. We offer a range of benefits within a single healthcare trust including private medical, cash and dental benefits. We also provide all healthcare trust clients with a 24/7 Virtual GP Helpline & App. 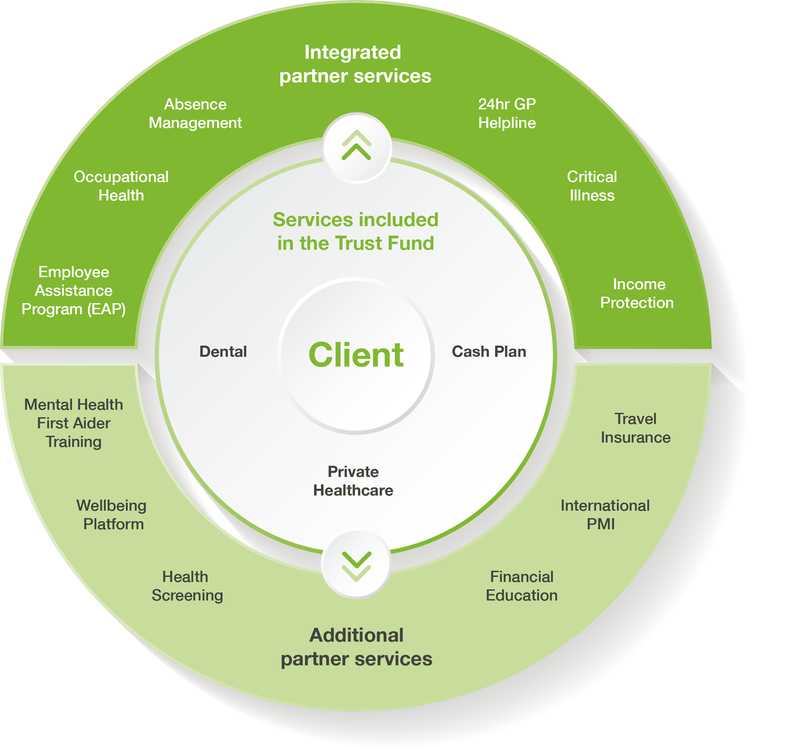 We are also able to offer clients a range of complementary products and services through specially negotiated partner arrangements, including a fully integrated EAP, Financial Education, Absence Management, Occupational Health, Travel Insurance, Voluntary Lifestyle Benefits and a Benefits Communication platform. Key to the Healix proposition is our clinical expertise and superior nurse-led case management. This enables us to act as a central hub on behalf of our clients, coordinating provision of overlapping services and directing employees to the most appropriate benefits available to them, whether provided by Healix, one of our partners or through other providers. We will engage with other service providers to deliver the best outcome for the client. For example, it is not uncommon for an employee to be claiming from the mental health benefit through their company PMI policy when they could be utilising a 24hr telephone counselling service, or even face to face sessions, already funded through their employer’s EAP provider. If there was a joined up approach with the EAP and Healthcare provider, costs could be mitigated to reduce annual spend, but more importantly the employee would receive the most appropriate immediate care. The introduction of these new services means Healix are able to extend the range of benefits we offer clients within a fully integrated health and wellbeing program. Equally Healix are keen to work with a client’s existing providers too, whatever is best for the client.